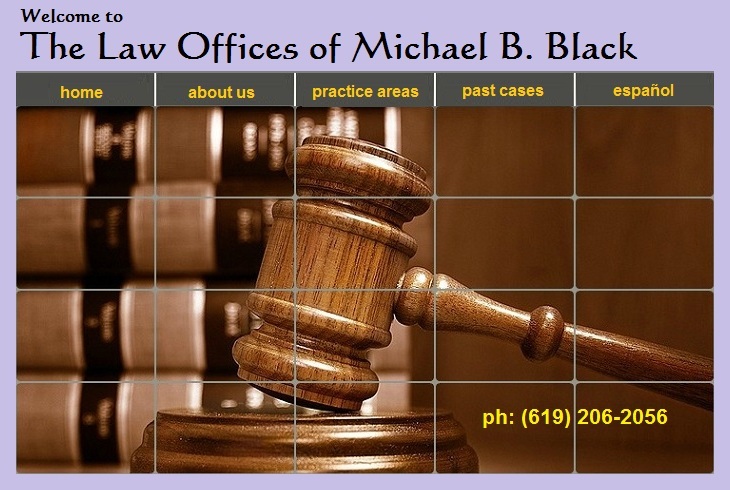 Attorney Michael B. Black in San Diego. Accident Lawyer. • accident and injury cases involving auto, motorcycle, and/or pedestrians. I enjoy helping those who have been hurt and are in need of legal assistance. • unpaid wages, rest and meal period violations; I enjoy fighting for those who haven't been paid a fair wage, haven't been paid overtime, or where the employer prohibitted required meal breaks and rest periods. All workers, regardless of status here in the U.S., must be paid according to law. I am different from many law firms in that I personally work on all of my clients' cases from the beginning to end. I answer my own phone and I spend time with my clients. I answer their questions in a friendly and informative manner. To provide the quality legal service that I believe each client deserves, I limit the number of cases I take. This allows me to spend the time needed to aggressively work on each case. Please don't hesitate to call me if you are looking for a friendly, knowledgeable attorney to handle your case in an aggressive manner. I can be reached at (619) 206-2056, or you can submit your information on the right.